I got up early this morning, grabbed a basket and my camera and took a walk. 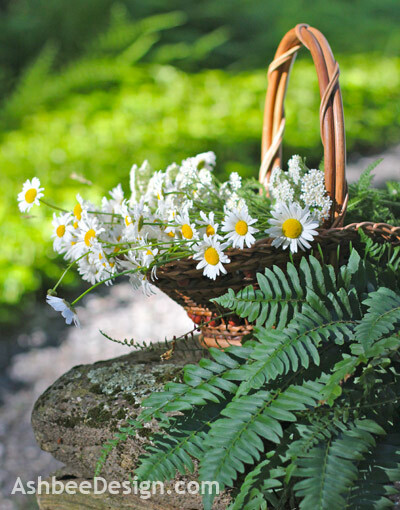 I had noticed that the wild daisies are in full bloom along the road and I thought they would be the perfect June bouquet for my ladder. I harvested a bunch just as the sun cleared the treetops. My pickings didn't put a dent into the vast number blooming. I did have to be wary of the poison ivy and had to keep my feet on the road. I pulled my socks up high to avoid exposure. Must have been a humorous site - a little lady, in sneakers with white socks pulled up high out picking daisies! The begonias were looking pretty sad so I dumped them out. All the leaves had shriveled and fallen off and each new one fell victim to the fungus quickly. Obviously I don't have a green thumb and advice would be appreciated. I decided to make plastic liners for the tin pails so I could put tape over the top. To make the liners, I repurposed an empty 1 liter soda bottle and sliced it to the perfect height. By putting strips of tape on a liner, the edges of it don't show, and the tape helps hold the flowers up. This is a great aid in arranging wildflowers especially in containers with wide open tops. After crisscrossing 1/2" wide masking tape, I put the plastic liner into the pail and started arranging the daisies along with some ferns and what I am guessing is a wild yarrow as well. I quickly started hanging them on my ladder because I was losing the sun for photos. This ladder is on the northeast corner of my house and sun reaches it early in the morning only during the longest days of the year. Soon it will be gone for another 11 months. I kept the arrangements a little on the wild side, quick and easy, like the daisies. By the time all five were done, the sun was already no longer reaching this corner, but that is ok. 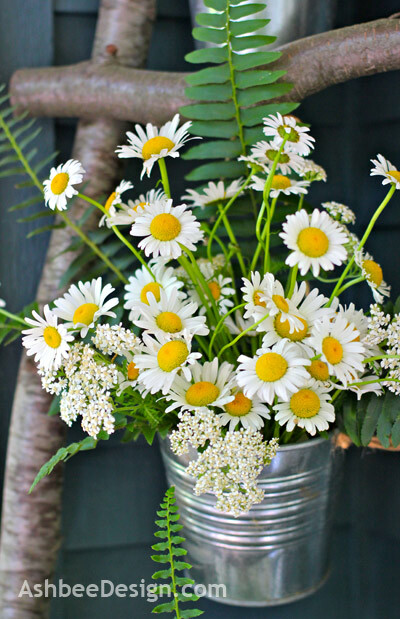 It is now brightened by five arrangements of white daisies with bright yellow centers. Have you built a ladder for your entry yet? Thinking about how to decorate it for the 4th of July? I am! 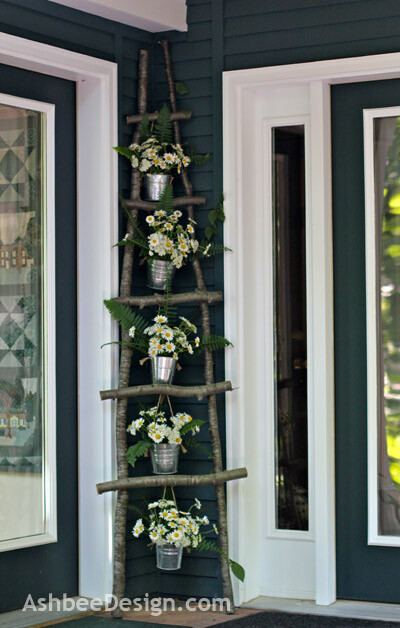 Love your ladder -- how wonderful the daisies look in the hanging tin containers. I am definitely making one of these this summer. Thanks for sharing. Thanks Vanessa, I thought the daisies went well with the tin pails. 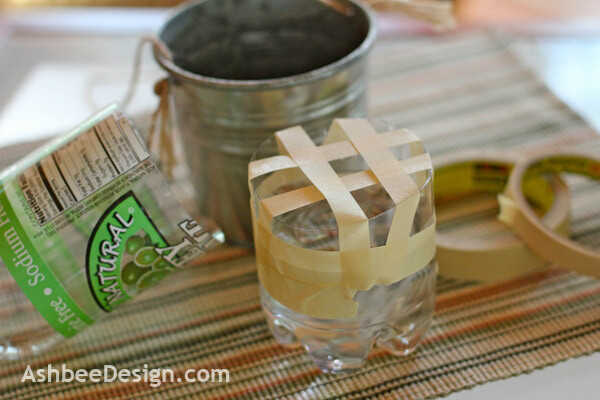 I think Mason jars would also be effective and very trendy but I didn't have any of those. Send me a picture of your ladder once you make it. I appreciate your visiting and commenting. That is so cute!!! I love love love it!!! I have no advice about gardening as I tend to over-water or under-water and end up killing everything. 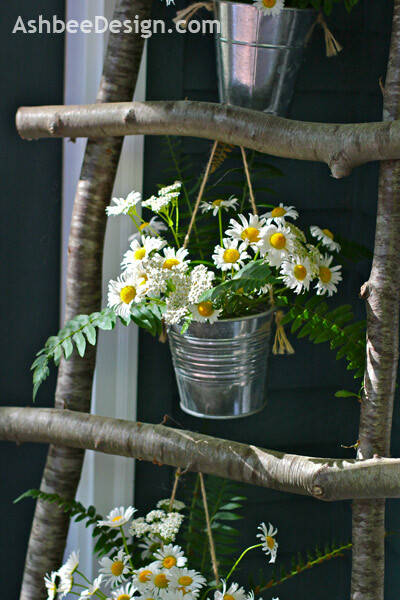 Daisies are the happiest flower EVER and they look fantastic on your ladder! Where's our pic of you in the socks!? Luckily no one was there to take that picture!!!! 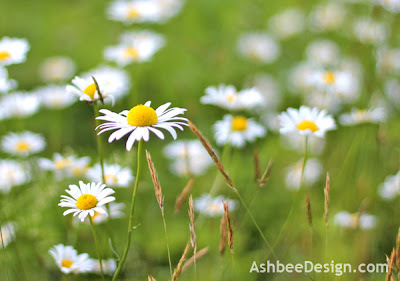 I agree that daisies are a happy flower, full of summer sunshine. Marji, that is adorable! I think I like the daisies better than the begonias. You captured summer! We agree, this is a much prettier solution than the begonias. I just need to remember to water them! Love it! It's so beautiful - that wood and the delicate daisies! Perfect combo. Oh I love the ladder idea! I'll have to incorporate something similar in my garden! Your photos are beautiful - made me feel like I was along with you on your adventure. And one of my favourite flowers is daisies - I have many throughout my garden. Lovely! I'm visiting from Between Naps on the Porch. Thanks for visiting Donna. This ladder was truly easy so give it a try. Be sure to send me a photo when you do! I am still working on the photography thing. Certainly improving in using depth of field with objects that aren't moving. How pretty! 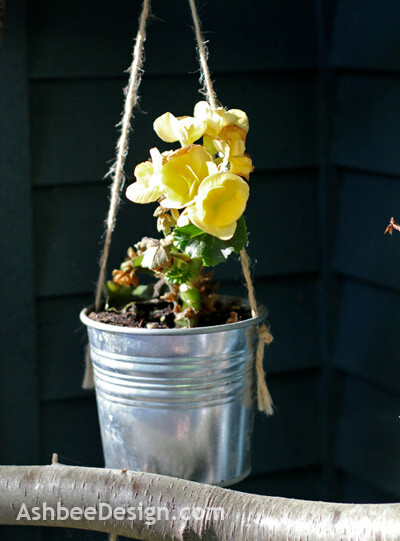 The daisies look precious immune buckets and your ladder is adorable! Would love if you stopped by my linky party to link this up! So lovely and thanks for the tip on the criss cross of tape on the vase top. Flower arranging is always a challenge for me. The tape trick is one that helps! Just switched it to gerber daisies. Didn't get a 4th of July look that i liked. Need to collect more red,white, and blue before the season! It continues to withstand the test of time. The wild daisies died and a got a great deal on 4" pots of bright yellow gerber daisies, so back to yellow. Just about everyone comments on it when they visit - even the electrician!